Salford Red Devils owner Marwan Koukash has reiterated his desire for Super League to increase the salary cap. Currently club's in England's top flight can spend £1.85m on their squad, with another £175,000 allowed for a marquee player outside of that. 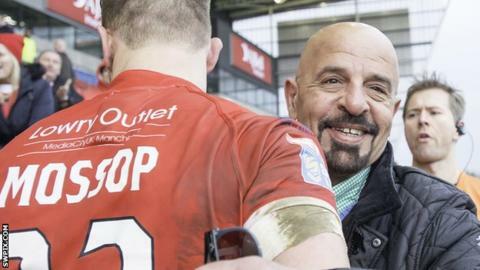 Koukash called from an increase in the cap in 2013 when he bought Salford and hopes to discuss the matter at a Super League meeting this week. "The cap is very, very restrictive," he told Rugby League Extra. "The fact that it is the same as it was five years ago tells you something and it is restricting you - you can't even keep it with the rate of inflation. "I'm not saying every owner or club is going to be able to do it but the fact that you're telling everybody to keep it below that level and the likes of [Leigh owner] Derek Beaumont, myself and [Warrington owner] Simon Moran - we've got the funds, we could go out and invest in trying to build stronger teams." After only securing their Super League status with an golden-point drop-goal in the Million Pound Game against Hull KR last season, Salford are fourth after winning five of their first eight games in 2017. It is the second full season for head coach Ian Watson after he replaced Iestyn Harris in 2015 and Koukash believes the 40-year-old former Red Devils scrum-half has made a difference. "Ian is a fantastic coach and what makes him one is the fact he is a very, very nice person," he told BBC Radio Manchester. "A coach is a leader more than anything else and his players are his soldiers - if the soldiers trust in the leader they'll do their best, and that is what I think has made an awful lot of difference this year. "We've got a very young side. This side will improve this year from last year and I believe they will improve further next year as well." Meanwhile, Salford have announced assistant coaches Martin Gleeson and Willie Poching have signed new contracts.